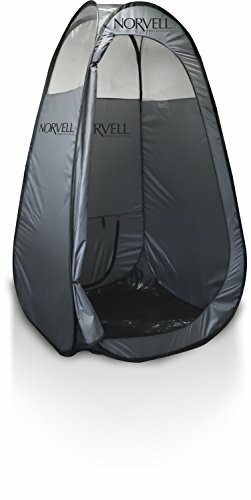 Now even larger, the Norvell Mobile Pop-Up Tanning Tent is ideal for Home, Spa or Mobile spray tanning. The spacious tent opens to 3.6 feet wide x 3.6 feet deep and 7 feet high. Made of durable nylon, the tent weighs approximately 8 pounds. Clear windows allow maximum lighting for best results. Rear opening allows for placement of our Overspray Reduction Fan to extract overspray particles during tanning sessions. Heavy duty vinyl flooring protects tile or carpet from overspray and allows easy clean-up between clients. Tent Dimensions: 84" high x 44" deep x 44" wide.